For Latkanich and all those who believe their water has been tainted by fracking, there are few remedies. [And even less in Canada, with a much more inaccessible (and abusive if accessed) legal system than America has. Canada has no EPA.] Congress took away the most powerful one in 2005, prohibiting the Environmental Protection Agency from safeguarding drinking water that might be harmed by fracking and even denying the regulator the authority to find out what chemicals companies use. That provision of the Energy Policy Act was justified by an EPA study about fracking into coalbed methane reservoirs, completed under the George W. Bush administration, that concluded that fracking posed no risk to drinking water. Concerns about the study emerged from the outset, including a 2004 whistleblower complaint that called it “scientifically unsound.” Now, InsideClimate News has learned that the scientists who wrote the report disagreed with the conclusion imposed by the Bush EPA, saying there was not enough evidence to support it. The authors, who worked for a government contractor, went so far as to have their company’s name and their own removed from the final document. Winning these exemptions is at the heart of a successful strategy by the fossil fuel industry and its allies in Washington to limit environmental oversight of companies’ operations. As a result, oil and gas drilling and production are exempt from laws regulating hazardous waste, chemical-laced runoff from well sites and toxic air pollution from well equipment. Some exemptions, such as the Halliburton loophole, were justified by EPA studies whose findings were ignored or bent to political ends, according to documents and interviews with scientists, lawmakers and former regulators who have worked on federal rulemaking since the late 1970s. The Cadmus study was not the first EPA report to have its science thwarted, and under President Donald Trump, it likely won’t be the last. Current EPA Administrator Scott Pruittis a staunch ally of fossil fuels, and his agency is moving on several fronts to quash science that documents the oil industry’s contributions to climate change and other forms of pollution, the first step to rolling back regulations, critics said. Industry got a huge boost when Cheney, the CEO of Halliburton, became vice president in 2001. At the time, fracking was unknown to the broader public. But an energy policy task force Cheney helmed in spring 2001 highlighted fracking’s potential, and it recommended a comprehensive exemption to the SDWA for all types of fracking, not just for coalbed methane. The EPA cautioned against an overly broad approach. Cadmus took over the report in late 2002 from the original contractor. The project faced obstacles from the outset, according to EPA documents and Cadmus staff. The oil and gas industry declined to provide information about the composition of fracking fluids, asserting that they were trade secrets. There wasn’t enough time or money for Cadmus to begin monitoring groundwater before, during and after fracking jobs to see if the process affected water quality. With little insight into what was actually pumped into the earth during fracking, Cadmus researchers had to rely on existing literature and discussions with a limited number of experts familiar with the process. Cadmus sent chapters of its working draft to the EPA starting in mid-2003. The agency immediately questioned the validity of the findings. Against common scientific practice, the EPA urged Cadmus to include an oil industry study that had not been peer-reviewed. When Cadmus staff resisted, the EPA manager asked a Cadmus scientist, “‘Can’t you say something positive about it? '” the scientist recalled. In drafts of the executive summary, typically a report’s most widely read section, the authors referred to potential threats to public health as the reason for the study. “The goal of this Phase I study was to determine if a threat to public health exists as a result of USDW [Underground Sources of Drinking Water] contamination from hydraulic fracturing fluid injection into CBM [coalbed methane] wells, and if it does, whether the threat is great enough to warrant further study,” the authors wrote. The Cadmus scientists said they realized over time that their findings about risks to underground drinking water diverged from what the EPA wanted. 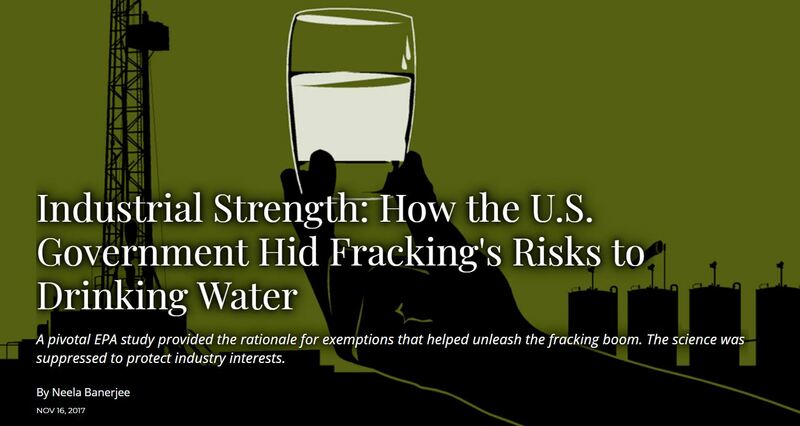 The scientists determined that fracking does pose some risk to drinking water. They concluded that monitoring of fracking activities and more information from industry would be needed to quantify the risk. The EPA decided the study’s conclusion should be that fracking did not pose a threat to groundwater and therefore did not require further study or federal oversight. The EPA routinely hires contractors to conduct studies, and the firms’ names are generally tucked away in appendices or acknowledgements. Contractors appreciate a mention because if the studies are well-regarded, they serve as a form of marketing. The 2004 coalbed methane study notes the use of a contractor but does not identify Cadmus. “We had no power over the final report. The only power we had was to take our names off it,” said a Cadmus team scientist who declined to be identified because of concerns about job security. Inside the EPA, some scientists were also troubled by the study. “What I found objectionable was that it was written to have a good P.R. effect on people,” said Mario Salazar, an engineer who was an internal reviewer of the report and worked as a technical expert at the EPA’s underground injection office. The EPA’s inspector general launched an investigation into Wilson’s complaint. But the inquiry was closed after the Republican-controlled Congress passed the Energy Policy Act in 2005, codifying in law the conclusion of the coalbed methane study and exempting fracking from the Safe Drinking Water Act. In mid-2012, Chevron Appalachia hydraulically fractured two wells on a hill about 400 feet behind Latkanich’s house. They produced gas by winter, and Latkanich got royalty checks that at first were as high as $11,000 a month. He paid off legal bills and his mortgage. The company carved out a two-acre well pad from the hillside for three large impoundments to hold water [or produced water/frac waste water?] from other gas sites that was trucked in to frack the two Latkanich wells. During a hard rain or snow melt, runoff from the well pad flowed down the hill, over the site of Latkanich’s well, and into his garage and basement. Latkanich’s drinking water developed a metallic taste over the course of the year. He started to get frequent diarrhea. In early 2013, Ryan, then 3, came out of the tub covered in open sores. Latkanich called the state Department of Environmental Protection (DEP) to test the water. Chevron Appalachia declined to hook up Latkanich’s home to the nearby municipal water system and provided him with a large outdoor tank instead. The DEP tests did not show anything wrong with the drinking water, and the company took the tank away. Still worried even after the 2013 tests, Latkanich began to have bottled water delivered. Because he’s on a fixed income, Latkanich and Ryan use it only for drinking. They still cook, brush their teeth, bathe and wash dishes and clothes in well water. Ryan’s mother left in August 2013. Medical tests found nothing wrong with Ryan. Peer-reviewed science has been mixed so far about the links between fracking and incontinence or gastrointestinal problems among residents who use nearby well water. Latkanich called the state DEP to test his water. He also contacted John Stolz, director of Duquesne University’s Center for Environmental Research and Education. The results have been ambiguous. Unlike most people, Latkanich had an independent lab test his water in 2011 before fracking began, giving him a baseline. In its February 2017 test, the state found increased turbidity, or cloudiness, and the presence of coliform bacteria. DEP officials returned in early November to take more samples. Stolz’s test found higher levels of iron, calcium and strontium. The amount of sodium had more than doubled to 510.38 milligrams per liter of water from 238.38 in 2011, before fracking began. The elevated levels of sodium pose a high risk to Latkanich, who suffers from kidney disease. “The test results prove I can’t drink this water,” he said. The ambiguity is typical of water tested near fracking sites. If water quality has worsened, there is seldom a bright line to the fracking. That’s partly because under the Halliburton loophole, companies do not reveal everything they inject underground, so labs do not know all the substances they should test for. And in many cases, homeowners enter into settlements with energy companies that prohibit them from revealing what happened. Latkanich would like to stay in his house, which he poured thousands of dollars into because he thought he would grow old in it. Now, his fears about the well water nudge him to go, but he worries he can’t find a buyer. “I can’t sell the house now: It has foundation issues and pollution. The value of the house has dropped like a rock,” he said. The most likely buyer would be Chevron, and Latkanich is determined to wrest accountability for the damage he believes the company has done. But he can’t afford a lawyer to help him negotiate a settlement. One non-profit told him his case was too big and complex for it to handle. He gets a disability check and about $550 monthly now in royalties for his two gas wells, so he doesn’t have the money to hire private firms. “This farm is ruined,” he said. “Forever,” said Ryan, who had come into the kitchen from running around outside. “Buy me out and I’ll move somewhere where there isn’t fracking,” Latkanich said.